According to the Los Angeles times, this ruling late Wednesday afternoon will relieve immigrants from Haiti, El Salvador, Nicaragua and Sudan from the threat of deportation. U.S. District Judge Edward Chen said this decision would cause "irreparable harm and great hardship." Judge Chen wrote: "TPS beneficiaries and their children indisputably will suffer irreparable harm and great hardship. Many have U.S.-born children; those may be faced with the choice of bringing their children with them (and tearing them away from the only country and community they have known) or splitting their families apart." The ruling said the Trump government failed to show the harm in it if the 20-year-old program continued. This decision came in response to a class-action lawsuit alleging that government officials approached their decisions about TPS with a political agenda, ignored facts and were motivated by racism. Judge Chen said there is evidence that "President Trump harbors an animus against non-white, non-European aliens which influenced his ... decision to end the TPS designation." I know many Haitian who will sleep better after they read this news. Trump has no empathy for any nonwhites. This is to get Votes for the election just like the 2016 election. États-Unis: un juge a empêché l'administration Trump de mettre fin au statut de protection temporaire (SPT) des Haïtiens et d'autres immigrants soudanais, nicaraguayens et salvadoriens. 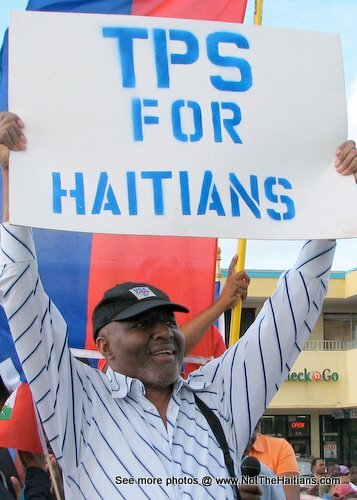 TRUMP paka voye Haitien ak TPS yo ale anko! Gen yon jij California ki di pagen sa pyès! Jij la di Trump on ti jan rasis kont immigran ki pa blan, li bloke misye.